be a better way to keep seniors in their own homes with one on one care that meets the individual clients’ needs. In 2008, they opened Timberland Home Care in the Mount Washington Valley. They run the leading 24 hour, non-medical homecare business in that area. Coming back to their Maine roots, Frye and Reed are opening an office at 585 Roosevelt Trail in Windham. The company offers companionship, hygiene assistance, laundry and so much more. Clients can receive a variety of services from one five hour shift to 24/7 care, Timberland can be there to provide light housekeeping, medication reminders, meal preparation and transportation. Whether it’s a weekly companion to play games, read to them or do crafts, they can meet those needs. They have also worked extensively with the elderly with Alzheimer’s and dementia. “We realize no two people are the same and everyone’s needs are different. With that in mind our services range from extensive care to having a companion. We are very versatile in the care that we give,” they added. They can provide respite care for those taking care of aging loved ones. When Frye and Reed worked in the nursing home, there was no time for one on one care, where they would get to know the residents, their likes and dislikes, their habits and their stories. They said that some days they left crying. They didn’t want to do that anymore. “Our business is very family oriented,” said Reed. They are privately owned, and not part of a larger corporation. “We’ve been in the trenches.” They still work directly with the clients, if needed. At this time, they are looking for employees to start work in this area as soon as possible. They prefer employees with a CNA/LNA license or medical experience, but would take on someone with experience in the field or who is a PCP. All employees have criminal background checks, reference check and must have a clean driving record. They have employees from ages 20 to 80. “You can teach all the basics, but you cannot teach somebody to be a caregiver,” Frye said. They try to match the right person with the right client. Each client receives a free in-home assessment. Reed and Frye said they would not send a caregiver into a home that was unsafe. Care is offered all over the Sebago region from Bridgton and Naples to Westbrook and Gorham. For all of the towns they serve, check on their website. The company is licensed and insured in Maine and New Hampshire. They take both private pay and long term care insurance. 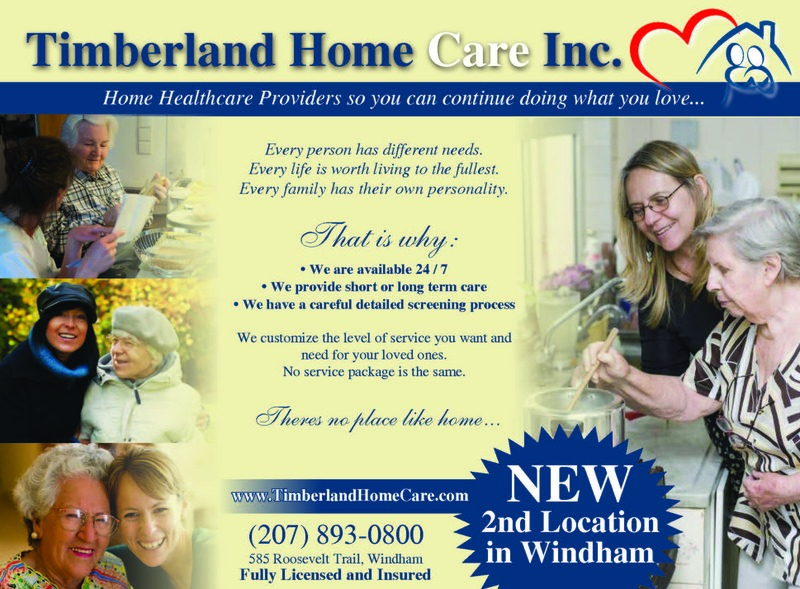 For more on Timberland Home Care, visit www.TimberlandHomeCare.com, email TimberlandHomeCare@Live.com, or call the office at 207-893-0800 starting December 1.